I was religious about eye cream from the age of about 12 until about age 23, when I somehow decided I was invincible to the kicks of crow’s feet. Now, as I inch closer to a new decade of life (but hey I have a few years left of my 20s! ), I’m revisiting eye creams and serums a little more seriously and figuring out how to arm myself against fine lines, puffiness, dark circles — the works! 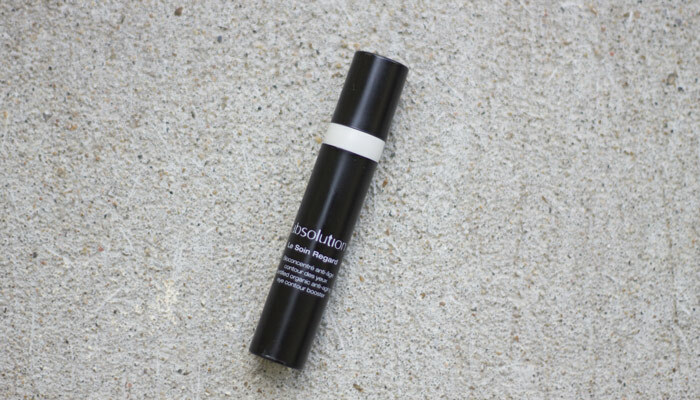 One eye cream that I go to on those too-early mornings that greet me with swollen, puffy eyes is Absolution’s Le Soin Regard Eye Contour Booster. Back when I was younger and could somehow survive on four hours of sleep yet still look OK in the morning, a simple morning oil or cream would have done me just fine. Now, if I just manage six hours of sleep, I wake up with swollen eyes that beg for steam, moisture and a few brightening tricks. Before dotting on my luminizer to fake a good night’s rest, I press in Absolution’s Le Soin Regard Eye Contour Booster and can very quickly feel and see the effects of tightening caffeine and green tea extract without any of the dryness you may associate with skin-tightening ingredients (thank you, aloe, jojoba, argan and other oils!). While it doesn’t instantly zap puffiness, it seems to reduce it greatly throughout my morning makeup routine and prep my skin for concealer and brightener. After using this eye cream, I can even go a little lighter-handed with my usual brightener (I like RMS Living Luminizer and The Balm Mary Lou Manizer) thanks to the addition of mica in Absolution’s Le Soin Regard Eye Contour Booster. It helps reflect light and minimize those dark circles. 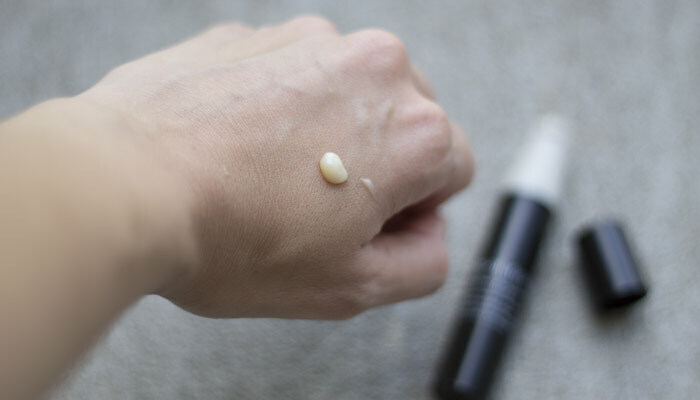 If I’m still feeling a bit puffy or just self-conscious once my makeup is set, I can press in a little more of this cream on top of my undereye makeup to get a bit more of that tightening effect without disturbing my look (it’s soooo light!). Because this eye cream is so great for my daily routine, I reserve it for use in the morning or when I’m refreshing myself for a night out. I don’t like to waste this product at night before bed (nobody needs that mica when the lights are off! ), which helps me save this $43 tube for days when I really need it. Also, you can easily get away with using one full pump of this eye cream for both undereyes. The image above shows how hefty one pump is, and the texture is slippery and light enough to work into your skin very easily; sometimes I can even use a little less than half a pump depending on the day’s puffiness! So, all in all, when this tube is empty, I’m rushing to get another one. It’s definitely a staple in my beauty routine. Have you tried anything from Absolution? Do you use eye creams or serums? What are your favorites? Tell me in the comments section!